Turning the center switch to ON (green light from red) changes all the cannon balls into armored gems. Armored gems CANNOT be chomped by jaws! Turning the center switch to OFF (red light from green) reverts all armored gems back to Cannonballs. Cannonballs CAN be crushed by jaws. The secret to success is to avoid throwing the switch until you have about 10 cannonballs on the board. Then throw the switch, wait until you get more cannonballs and then quickly throw the switch off and back on again. In this way you can complete the level with only 3 switch changes! 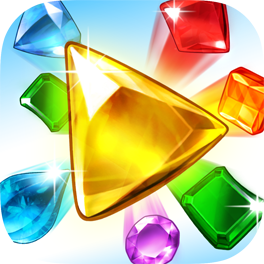 While jaws can't destroy armored gems you can by matching them with the same color, so don't do that! Start from the outer columns and work your way in to the center to avoid switch tripping.